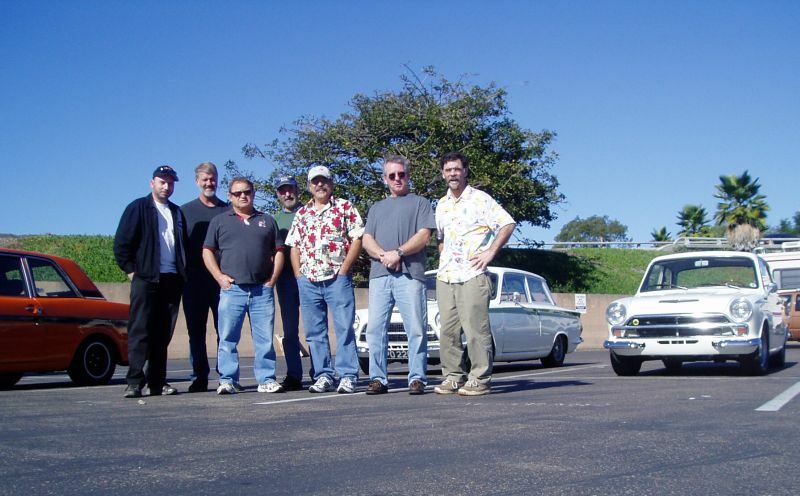 Pauly, Doug, John, Mike, Phil, Lew and Bob. 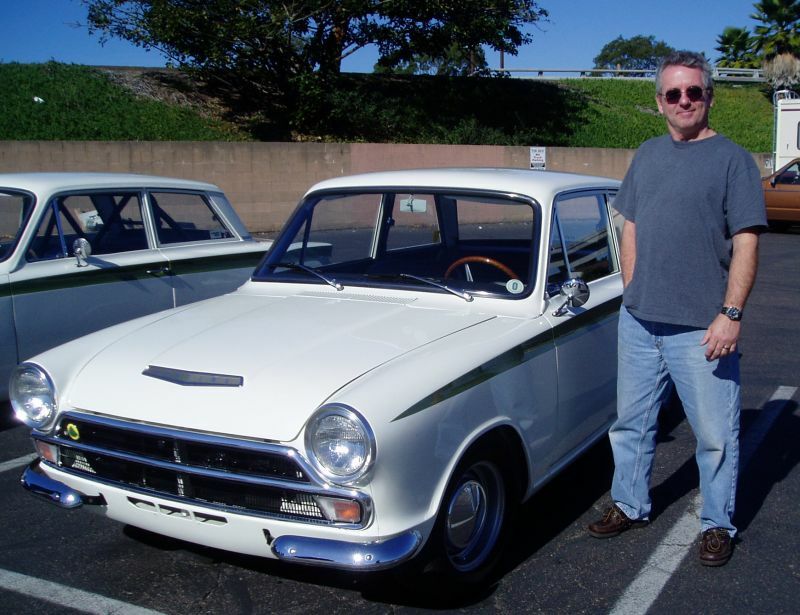 Lewis Hann next to his immaculate 1966 Lotus Cortina. Lew shows us the confetti still stuck on the cylinder head, pleasant reminders of his wedding. 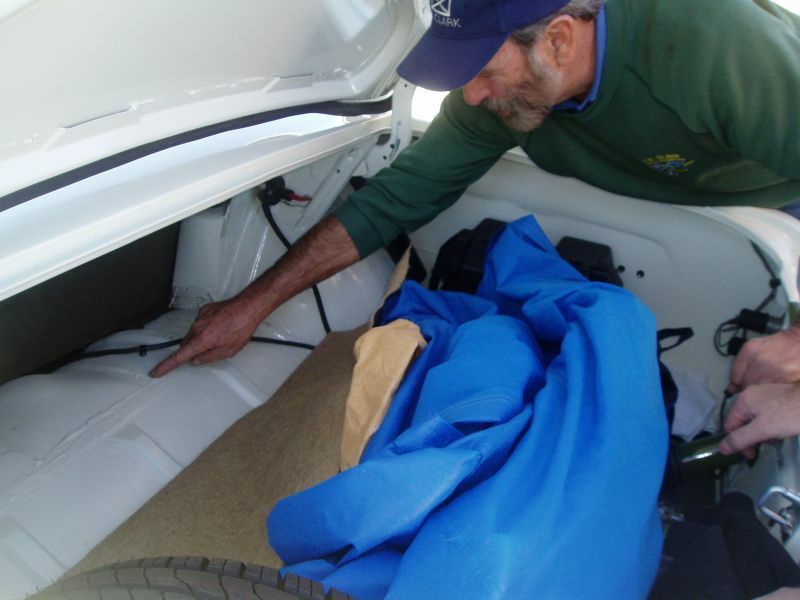 Mike Haynes points out the hand-hammered differential hump on Lewis' Lotus Cortina. 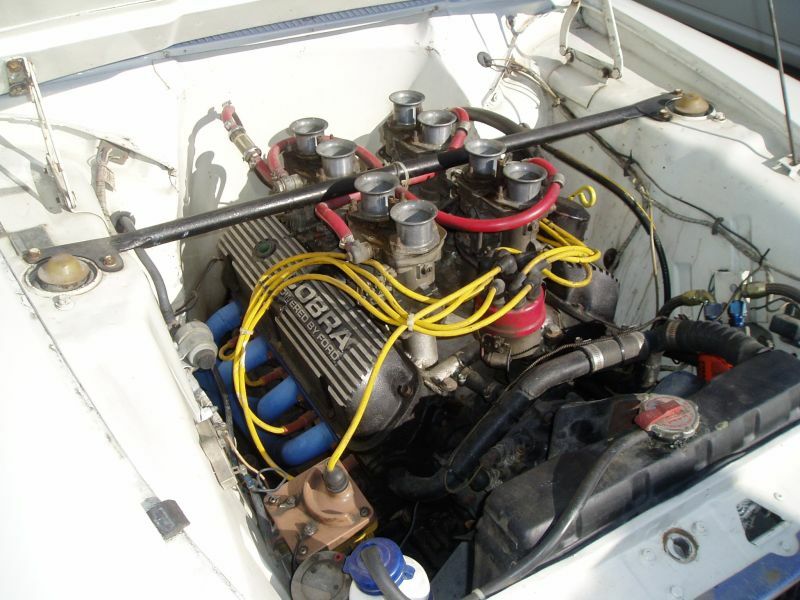 Ford 302 V-8 with 4 twin down-draft Webers. Note the large cut-out of the firewall, allowing the engine to be placed well back of the front crossmember. 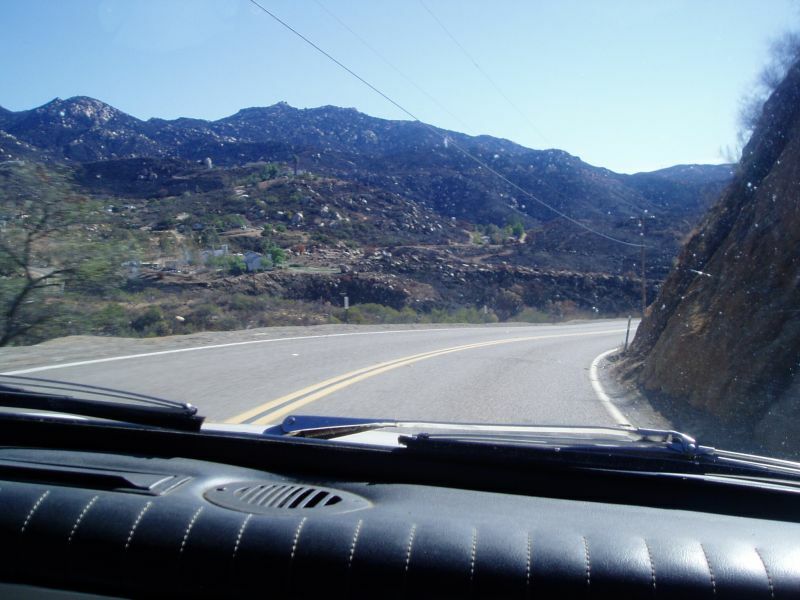 Up ahead, a Ford Mustang traveling at high speed on the early-morning San Diego Freeway- Mike gave a quick downshift, and it was behind us within moments. Seriously...just moments. 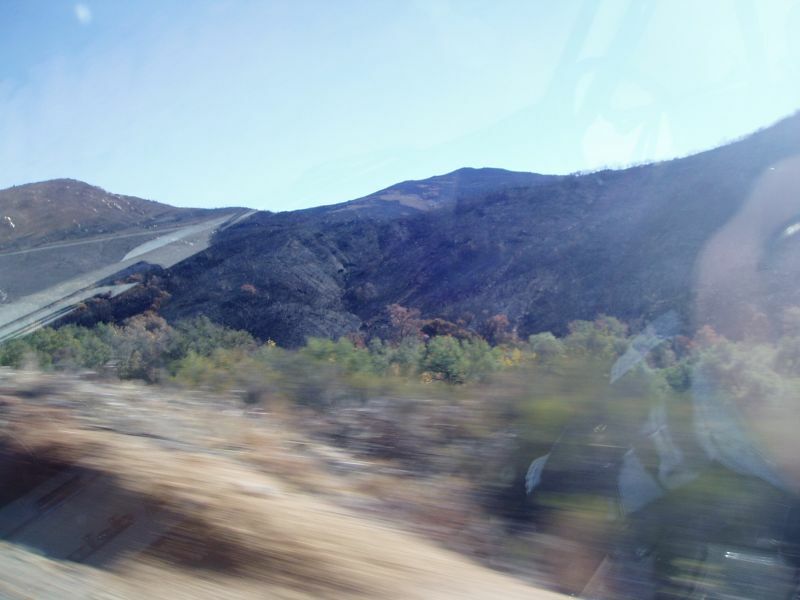 We saw lots of burned ground, most from the fires that started south in Mexico, and burned north into San Diego County. 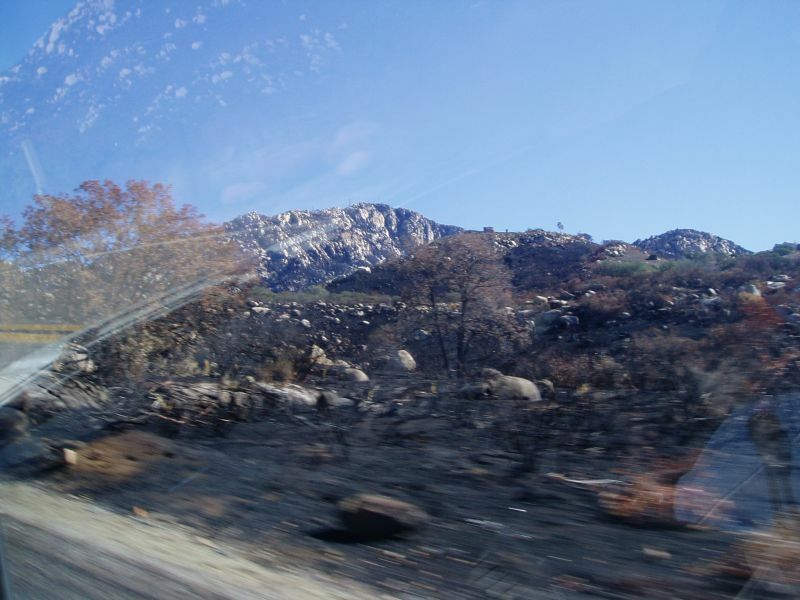 A view out of the windshield of Mike's V-8 Cortina of the burned hillsides of the back country. 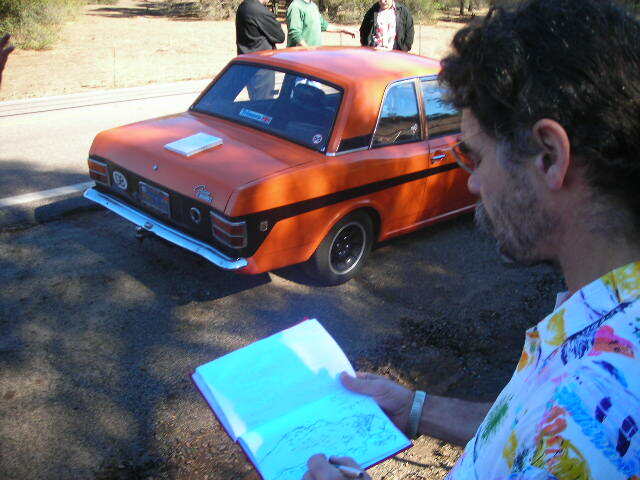 Doug took a picture of me sketching a rock-strewn hillside, while the 3 cars were parked on the side of the road. 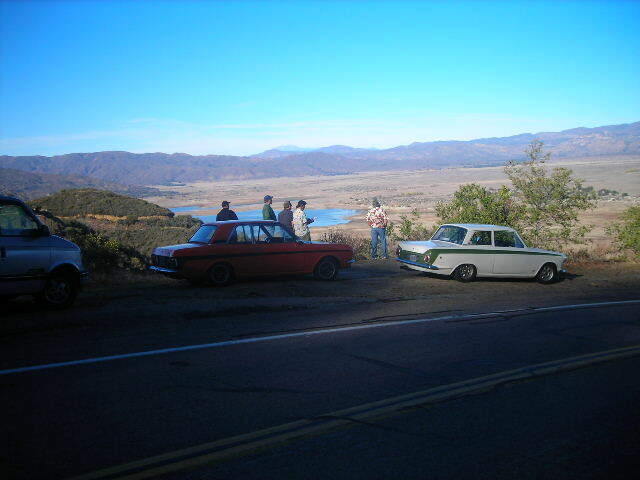 Phil's Cortina MKII is in the background. 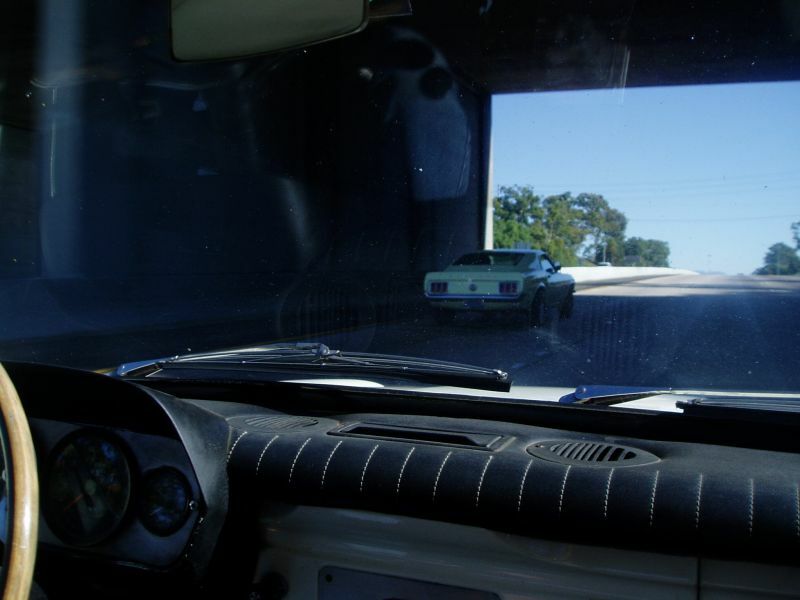 The ride in Mike's V-8 Cortina was... amazing. 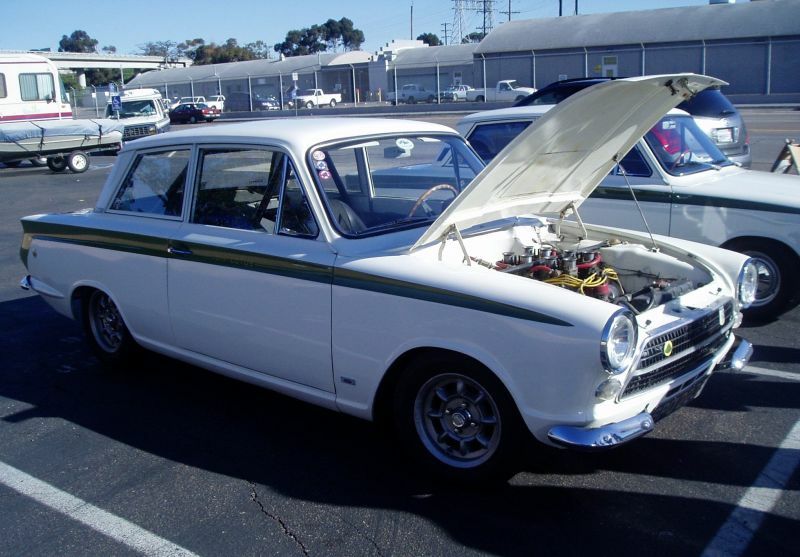 The car weighs "nothing", has close to 400hp, close-ratio 5-speed, narrowed Ford rear-end, a full roll cage, Paddy Hopkirk seats- it is perfectly balanced, perfectly predictable... simply amazing. 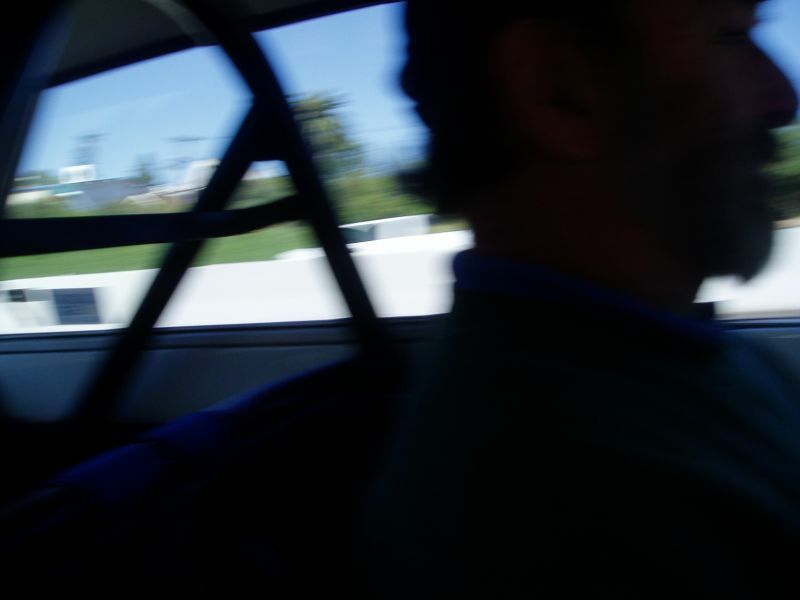 Doug took this photograph of us, while following along behind in Phil's MKII. 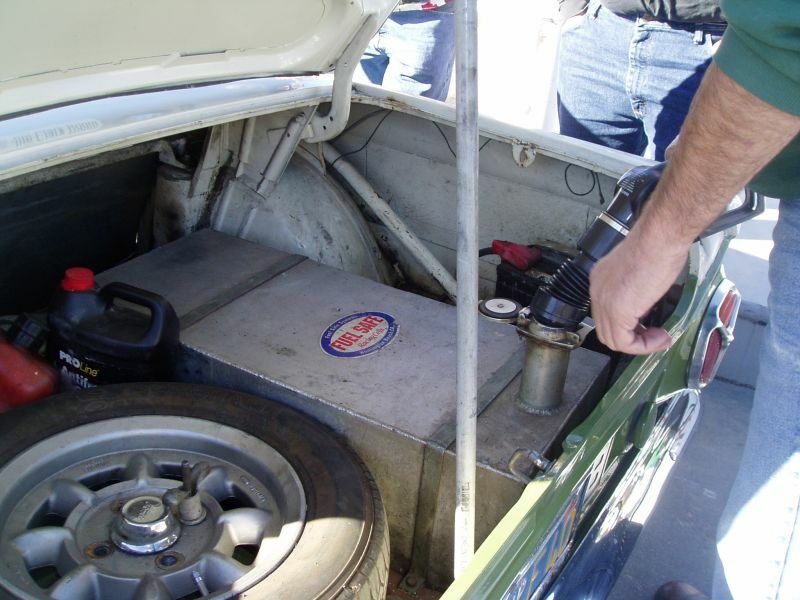 Mike has a fuel cell installed- also, check out the tubular suspension bracing. 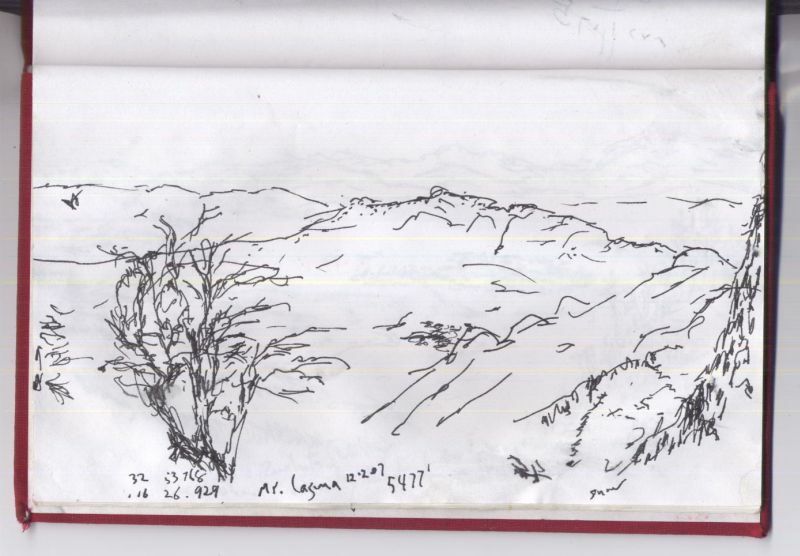 We stopped briefly at an overlook of Ranchita Valley, observing erosion on nearby hillsides, and examining manzanita growing nearby. 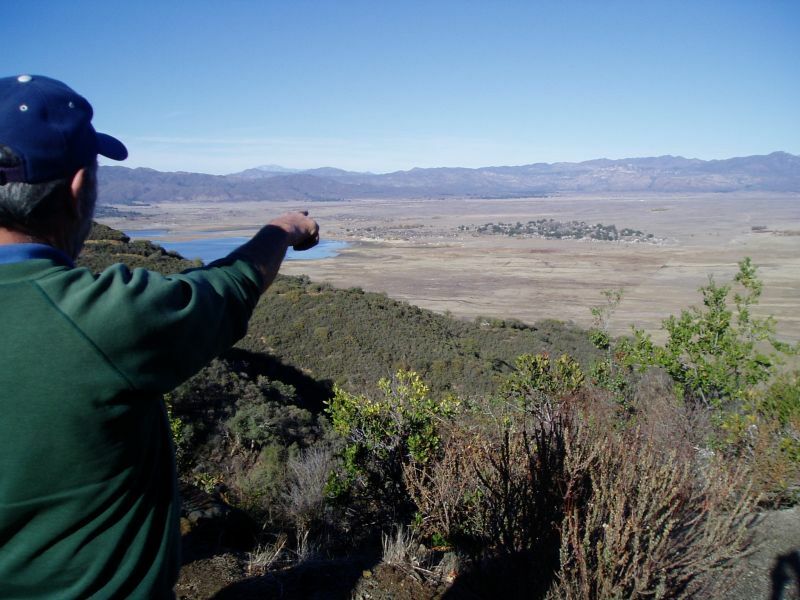 Mike points out Lake Henshaw (located in Ranchita valley) and explains how far the shoreline has receded due to drought. 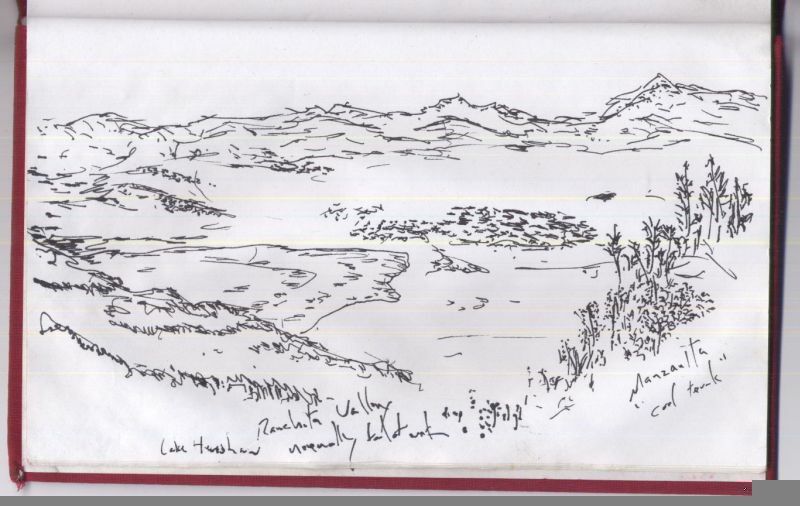 The large clump just right of center is usually an island surrounded by water from the lake. This lake can also be seen in the GoogleEarth image further below. Also, in my sketch, immediately below. 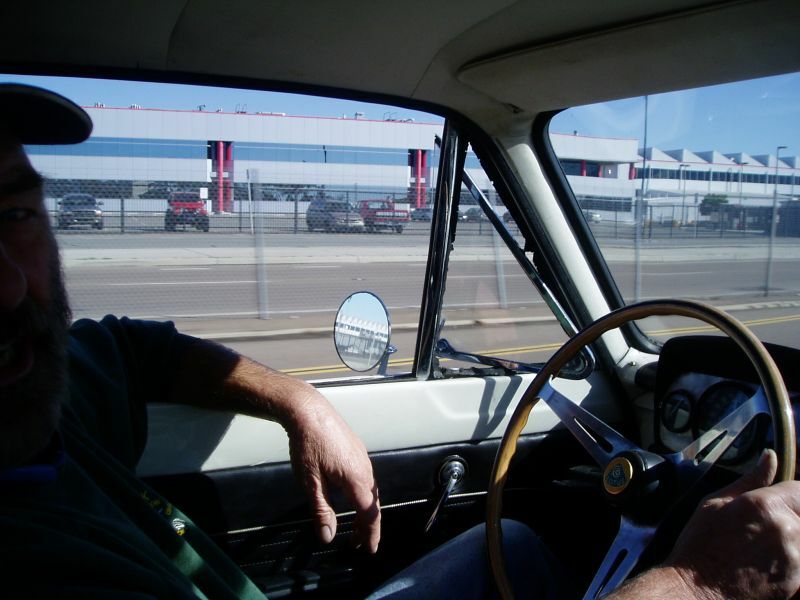 Phil, driving his 2.0 litre Cortina MkII. This is the route taken out of San Diego, from my hotel (flag 007 on the map), which was approximately 1 mile from the Convention Center, east towards Mount Laguna, north to Lake Henshaw, and back to Phil's home (flag 008), near the coast. Total driving distance- 186 miles. 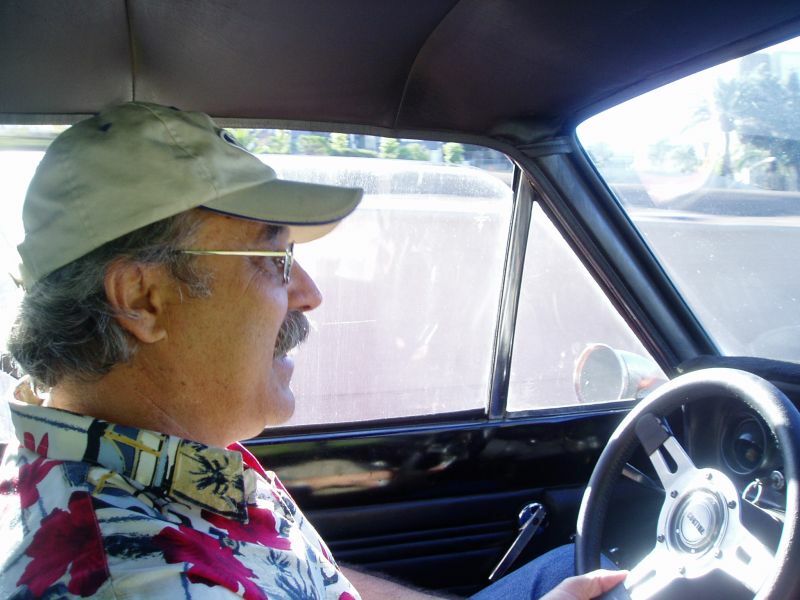 Later that evening, Mike gave me a final ride in the V-8 Cortina back to the San Diego Airport. 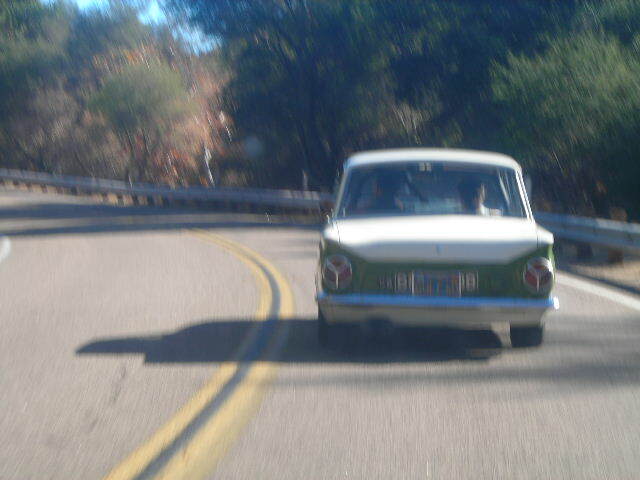 Thanks to all of the Southern California Cortina crowd for making the day possible!